What Tech Will Take Off in Developing Nations in 2015? 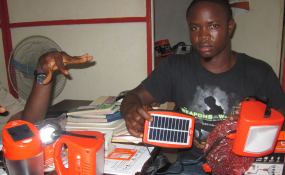 A worker at the Liberia Energy Network demonstrates how the solar-power lights are used. Around the Waterside, one of Monrovia's largest markets, drivers are constantly honking to make a path through the multitudes clogging the road. Street hawkers scream their wares, while marketers try to claim the attention of passersby. Amid the chaos on Mechlin street, one of the interlinking thoroughfares of the market, the Liberian Energy Network (LEN) has its Monrovia office, which also doubles as the point of sales. Inside, boxes of solar panel lights are stacked on the floor. Sherif, LEN's president, sits behind one of two desks in an office shared by assistants. A man who looks to be in his early twenties sits at the only visible computer..
With the help of an all-Liberian staff, Sherif, a former ministry of internal affairs official, presides over the sales and distribution of products that literally spread light during a very dark time. Before images of West Point during the height of the Ebola crisis were splashed across screens worldwide, Sherif's organization had sent 5000 solar-powered lights around the country in 2014, with a goal of doubling that number by year's end. Only 1.5 percent of Liberia's people have access to electricity, so even projects that start small can make a measurable difference. And flexible, nimble innovators can address needs that larger operators cannot. Among the unusual uses of LEN's lights is by fishermen, who take their small boats out into Monrovia's rough ocean currents before dawn and after dusk, when catches are better. James Logan, a 25-year-old high school graduate, chaired the fishermen association at Banjor Beach, a section of coastline in a western suburb of Monrovia. Trudging through the sand to reach the gathering of fishermen and canoes is made to look effortless by market women, chattering as they advance towards towards the boats, toting pans to carry the fish they come to buy. Logan was put in charge of distributing LEN's solar panel lights amongst the fishermen. "With the help of the lights," he said, "We can go far and stay longer time over water. The more you stay there, the more you catch." In a neighborhood and a city with protein deficiencies and not enough jobs, more fish mean more revenue – for both the fishermen who catch them and for the market women who buy from them and sell the fish to the public. Enhanced safety the lights provide is also a welcome benefit. A middle-aged fisherman, James Arthur, has been navigating the tumbling waters off Monrovia's coast for 15 years. "When we are about to put nets in the water," he says, "we use the lights to see – and it keeps us safe from ships and whatsoever thing is passing around." Supplying such needs was interrupted when Ebola struck the Liberian capital. Staff at LEN were unable to work in August. The neighborhood was cordoned off and movement in and out was limited to health workers, security forces and humanitarian workers distributing food. When the quarantine was lifted, LEN operations rapidly geared up again. The enterprise decided to focus temporarily on helping to fight Ebola. Within weeks it had distributed over 300 solar powered lamps to health workers caring for Ebola patients. That help could be literally lifesaving, as the lack of electricity has hampered the response to the deadly virus – partly by restricting vision after dark in the already shadowed treatment centers, where even daylight is limited. Giving health workers a way to see what they are doing, even when electricity is unavailable, not only helps them provide continual care but also protects staff. Despite the diversion in operations, Sherif remains committed to the goal of making Liberia the first country in the world to generate a majority of its lighting from solar power. It's an ambitious plan in a nation that only recently restored some of the grid power that was completely destroyed during over two decades of conflict – and even that is generated by diesel fuel. But in addition to being dirty, diesel has become costlier and scarcer since shipping companies began avoiding Liberia's ports due to Ebola fears. In 2012, the year after it was formed, LEN worked with the international NGO Save the Children to provide solar lights to its 150 clinics in Liberia, as well as solar lanterns to the group's nurse/midwives around the country. In June, just before Ebola interrupted LEN operations, the group was tapped as the only Liberian organization to be part of the U.S. Power Africa Initiative, "Beyond the Grid", for private sector participants. Even before Ebola struck, renewable energy sources seemed a smart approach for Liberia. The country has a vast potential for renewable energy generation. Six main rivers have the possibility of powering over a dozen hydro plants. Wind power could be viable in a number of areas, and wave power could be a future source of energy, due to Liberia's strong offshore currents. In January President Ellen Johnson Sirleaf attended a ceremony breaking ground on the Mt. Coffee hydroelectric project, designed to restore a facility destroyed in the early 1990s. Funders for the U.S.$230 million project included the European Investment Bank and the European Central Bank. In March, the government announced plans to develop another hydro project in Lofa County in the country's far north, near the border with Guinea. But while large-scale projects take time and large investments to develop, small community-based generation can help. In February President Johnson Sirleaf visited Lofa County, where she dedicated a micro-hydro power plant. She told an enthusiastic, cheering crowd that newly available electricity could help them develop small, revenue-generating businesses, such as ice-making and mills for processing locally grown rice. The president mentioned ice making, cold water, and rice mill processing as examples for small and medium enterprises (SMEs) could invest in, to greatly transform their lives. Cooperating to establish businesses could lead to more and more small and medium sized enterprises, she said. "Do not just use this electricity to dance at night under light, the president said. "It's your opportunity to make use of what you have been blessed with, and the only way you can help government fight poverty is by getting involved in the fight. This is why the hydro has been built here." She also paid tribute to Gary Duncan, a former Peace Corps volunteer in Liberia, who had experimented with a 30-kilowatt plant that served the local community. Volunteers were withdrawn from Liberia after civil war spread in the late 1980s, and the local generating plant was destroyed, like almost all infrastructure across the country, from giant dams to small bridges. Sherif, the LEN president, says that it was another Peace Corps volunteer from the pre-war era, Rich Fahey, who helped to make the solar light initiative a reality. Sherif and Fahey became friends and Sherif even traveled to the United States to visit Fehey and his wife. "Rich came back after the war, Sherif says, "and was shocked at the darkness he saw. He went back to the States and resigned his job as an environmental lawyer." Fehey returned to Liberia to explore ways to help. The idea the friends agreed upon was solar lighting. A project could get a quick start with minimal capital and grow from there. The initiators believed renewable energy offered more than convenience day-to-day. As a LEN statement says, "access to basic light and power is critical if Liberians are to be able to break the cycle of poverty, which is the root cause of past civil wars and the current health crisis." LEN was established as entrepreneurial not-for-profit organization. It isn't in business to make a large profit for its owners, but it does aim to generate profits to maintain and expand the enterprise. LEN benefited from the establishment in 2010 of Liberia's Rural Renewable Energy Agency (RREA), an independent agency of the government. Sherif says LEN was invited as one of several retailers to help import and distribute lights. "So with the support of the World Bank," he says. "RREA started bringing in lights and selling them to us at the factory price." Sherif says the main customers were expected to be people in rural areas, and the process of selling low-cost lighting in the countryside went well. But city people also wanted and needed the lights, so LEN began to cater to them as well. As critical as power can be in a rural area, it may be even more for immediately transformative for urban dwellers. Cities without electricity are not only dysfunctional. Traffic, population density and urban slums combine to make darkness dangerous. So LEN found a ready market for its lighting. One of the biggest customers is the largest labor union in Liberia – the Firestone Agricultural & Workers Union, Fawul. In Harbel, on the outskirts of Monrovia, Firestone Natural Rubber Company began operating in 1926 as part of the Firestone Tire and Rubber Company – a U.S. firm that was bought by Japan's Bridgestone Corporation in 1988. After Liberia's wars ended, the company renewed operations, working to restore the world's largest rubber plantation so it could again grow and harvest the product needed for tires. Fawul has 7000 members working as rubber tappers on the one million acre Firestone Plantation. "About ninety-five percent of the plantation doesn't have electricity," says Sherif. "So through the workers union, we sell to them at a minimum cost. The lights are portable and easily carried anywhere you are traveling. They are better than kerosene lamps and candles, and they are safer and cleaner." Even low-cost lights make a dent in a worker's budget. With help from LEN, Fawul members can buy the lights on installments that are deducted from their pay, so that every member can afford the purchase. Logan of the fishermen's association says the solar lights have helped his associates in many ways, too. "Before, they used to go fishing at night and can't see their way," he says, "and sometimes when they looking for things in the canoe, they will have to check until their hands can feel it. But with the lights, their work is faster." Fewer working hours means more time to use the lighting. "The lights have a 12-hour lifespan," Logan says. "So when the fishermen come back from sea, they can also use the lights in their homes. Even when the rain is falling, we can still use the lights. For me I also use the light at night for study." On a day when a reporter came calling, Beauty Kpehe was waiting and hoping for the catch to come in, so that she could buy some and sell them at the market. "I depend on fishing to educate my children and to take care of my family in the home," says the mother of nine. Nearby shanty houses, where most of the fishermen live, their corrugated roofs secured against the wind by large stones, appear to have recently taken a hit by the advancing ocean, as did Cece Beach, ,a popular resort which was wiped away by the sea on the other side of Banjo. Despite the mist from the roaring ocean, the handcrafted canoes start to come into view as they approach. The fishy odor grows stronger. Some women, Kpehe among them, had come ahead, their colorful African fabrics glowing in the sweltering sun. She sat pensively, her chin resting in her right palm, hoping she can buy enough fish to take to market, as children play under the watchful eyes of older women. The more fish the fishermen can catch, the more Kpehe can buy, so she hopes the waters have not been too rough for the creaking canoes to do well. "Some days I buy up to five thousand (Liberian) dollars," (about 60 U.S. dollars) Kpehe says. When I make a good profit, I buy food for the children and save the balance." Everyone who depends on these waters for a livelihood is grateful for the renewable lighting LEN supplies. As Liberia gets back to doing business, LEN hopes to grow into a powerful force for 'lighting Liberia' – and an example of the contribution renewable solar energy can make to Africa's cities and beyond.